Beef. Buenos Aires. Asados. Parrillas. Beef. Steak. Argentina. Parrilladas. BEEF. Like the other members of Argentina’s ‘triple threat’ of cultural customs (tango, mate, wine), the words ‘beef’ and ‘Argentina’ form part of the same sentence so often here that you can pretty quickly get sick of hearing about it. …But not sick of eating it! It’s not like anyone really needs to go over this again, but just in case you’re not living here currently, have never lived here, and this is the first thing you’ve ever read about Argentina, you should know that the beef here is very, very good. Alright. Let’s talk about the different cuts that are commonly available in this fine country. They are many, but let’s take a look at the Top 5, in ascending order of greatness (according only to the author, feel free to disagree!). First a few words on terminology though: an asado is the event of a barbeque (except in the case of an asado de tira – see below); a parrilla is both a grill and a restaurant specializing in grilled meat; a parrillada is a platter of different types of meat, and a bife de chorizo has nothing to do with sausage. This is the cut that most of us order the first time we’re in a parrilla. It’s the most expensive cut, and it’s tender and juicy. However, sometimes the flavor is not particularly thrilling. As an Argentinean friend once said to me, “Bife de lomo is like a beautiful model: nice to look at, but nothing under the surface.” What a model needs under the surface is a good personality, and what a steak needs under the surface is ‘marbling,’ which are the lines of fat running through the meat that dissolve during the cooking process and make it taste good. Lomo doesn’t have enough marbling to please some people. This is a good option for your third night of carne in a row, when you don’t think you’d be able to get through a full-size lomo or bife de chorizo. A favorite among Argentineans, it’s a thin cut of meat but very flavorful. It’s not as tender as other cuts, so if you order it, be prepared to use your jaw a little. The way they serve ribs in Argentina is different from what most of are used to: they’re cut very short. They have a lot of flavor and are usually deliciously crispy, and they’re also very cheap. Yes, some of the pieces you’re served may not have a lot of meat on them, and it’s impossible to eat them without getting bits stuck between your teeth, but for the combination of taste and value, they can’t be beat. This is an interesting cut, and not one that’s often served outside of Argentina/Uruguay. It’s a thin cut of meat from the flank of the animal that’s characterized by a layer of fat on the outside but none on the inside. If cooked properly the exterior fat gets crisp and the inside beautifully tender and juicy. If you haven’t already tried this one, give it a go on your next visit to a parrilla. For many people, myself included, bife de chorizo is the steak they could order day in, day out, and never get sick of. It’s exactly what a steak should be: big; juicy; with some tasty exterior fat; literally dripping with flavor. The only problem with bife de chorizo is that if you order it at a cheap restaurant you’ll generally get a cheap cut, and cheap cuts of bife de chorizo can be very fatty indeed. Order it at La Cabrera (Cabrera 5099, Palermo) or even El Desnivel (Defensa 855, San Telmo) though, and you’ll feel the earth move. Guaranteed. Another cut you should try is Tapa de Asado. I’d put this in second or third place. I am a HUGE “Ribeye” fan – generally lots of marbling and great favor. Como se dice “Ribeye” en espanol? Gracias! I’m so glad I found this at you blog, I’ve lived here for 3 months and already crave a lot of american food. 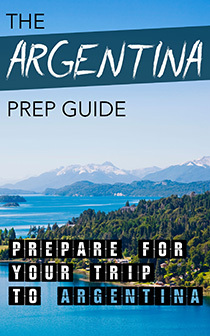 I was also trying to find which were the best cuts as my parents will come to visit and I wanted them to try really good argentinean meat, awesome blog! Hi guys. I went to “El Desnivel”, in San Telmo, as I read, in forums, it was a great grill. Anyway, I thought the price was overrated. We ordered a “bife de lomo” and a “bife de chorizo”, and a chicken “à Juliana”, I believe that’s how they called it. The “lomo”, the most expensive cut of beef, was good, but really rare inside, as I believe locals prefer. The “chorizo” was good, but not worth the price. Unfortunately, I thought I would eat better steaks in Argentina, but I find it here in Brasil more tasty and better pricing lists. I had a bife de chorizo in a Mall in Brasília (our capital), in a steakhouse called Zack’s which was deliciously juicy, you guys have no idea.. hehe See ya’ll later! 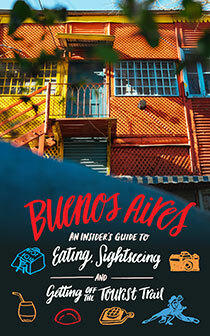 Good list but how can ojo de bife (ribeye) not be on it? Personally I think its more about ordering the parrillada(argentine mixed grill) in argentina rather than an individual cut. The best restaurant I found when I was in Buenos Aires is Del Plata Gran Parrilla in San Telmo. Beautiful food and fantastic service. Best of all,it wasn’t filled with travellers! BTW isn’t ‘Ojo de Bife’ eye fillet steak? Ojo=eye. 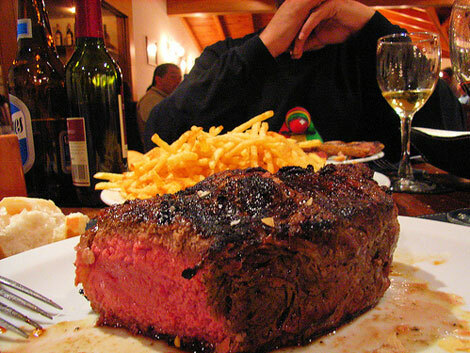 400 grs steak , at Parrilla La Casita, Ruta 5 , Km 125, For only 7 USD at blue rate…!!! I’ve been many times in Argentina and Brazil. There is no doubt in my mind- brazilian beef is simply the best! Sorry Argentina,and please leave the Falkland Islanders to enjoy heir good standard of life ..They do not need the instability and misery of Argentina.. I live in deep south Texas but have traveled to South America (Brazil). It didn’t seem that beef was as much a staple as cheese, lots and lots of cheese. As well as fruit, particularly avacadoes, even in a bowl of milk for breakfast. Maybe it was the region (Minas Gerais/Belo Horizonte), but I do believe I did not once have a beef dish other than a hamburger the entire time I was there. As for Rib Eye in Spanish it’s “Rib Aye” in these parts! No kidding, I nearly spit out my sweet tea when I saw it on the menu. Skirt steak is fajita, which gringos should recognize better. The thin flank steak is also known as arrachera. You are missing a lot! In the province of Santa Fe (big central province), the French influence made it so we cut the cow differently. So you can enjoy the best of them cuts, which is not listed here, “Entrecot”! Another delicious cut for the oven is called TAPA DE NALGA….